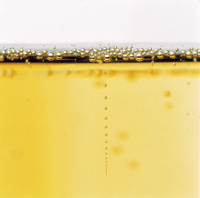 When a bottled wine contains more than 1 g/L of carbon dioxide, bubbles can be seen on the surface of the wine at 20ºC when the bottle is uncorked. Such wines are said to be beady or slightly gassy. At 2 g/L of carbon dioxide, which corresponds to an excess pressure of about 1 bar at 20°C in a closed container, the wine approaches the definition for semi-sparkling or pearl wine.